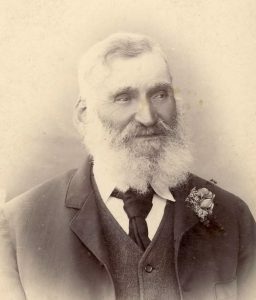 Richard Grange was born 6 March 1833 and christened 9 June 1833 at Bradwell-near-sea, Essex, sailed from London to Melbourne, with a declared age of 20, arriving at Hobson’s Bay at the height of the goldrush aboard the Arundel on 26 November 1852. [He] came to Australia about 1852 and to the district about 1864. Settling first in Buangor he soon afterwards selected land adjoining the main road about 5km east of Buangor. The rate books of the Shire of Ararat indicate that in 1880 he paid rates on 110 acres and a house in that area. His wife was formerly Ellen Gilligan whom he married in Ballarat probably in the late 1850s. Together they raised a family of six daughters and two sons. He was active in public affairs playing a major role in securing a railway siding for Middle Creek and as secretary of the Buangor cemetery trust from the origins of its records in 1884 until his death. Richard Grange died 1 April 1907 and is buried in the Buangor cemetery, as is his youngest daughter Ada Emily (Farrell). He married Ellen Gilgan (1837-1920) at Christ Church Ballarat on 3 November 1857, under the rites of the Church of England. Ellen (also recorded as Gilgin and Gilligan) was born in Kingscourt, County Cavan, Ireland. She sailed from Plymouth 10 March 1855 on the “Ravencraig” (also recorded as “Ravenscraig”). The ship arrived at Geelong 28 June 1855. It contained 229 adults, most of them young single women from Ireland. She is described in the passenger lists as passenger no. 197 – Ellen Gilgan – occupation, domestic servant. She had been living in Dublin was Roman Catholic and could read but not write. Her age was recorded as 21 is almost certainly incorrect. She was likely 17 or 18. She was engaged to be employed by Mrs. Swindles of Chilwell (a locality within Geelong) for £20/3/-for 3 months . On 22 April 1857, six months before her marriage, the following advertisement was published in the Ballarat Star: ‘Ship Ravenscraig – should Ellen Gilgan of Manor-hamilton she this, Thomas Browne would be glad to see her. Address: 101, Little Bourke-street west’. This would indicate that Ellen had roots in Manorhamilton, a town in Leitrim County, Ireland. At the time of their marriage Richard was a storeman of Ballarat, and she a servant, also of Ballarat. However they soon-after moved to the Buangor/Middle Creek area (Middle Creek is midway between Beaufort and Buangor). He was a committee member of the Middle Creek Church of England from 1886 and he died at his Middle Creek farm on 1 April 1907. The following unverified information comes from Richard Grange’s grandson: Grandfather Grange came from England and was educated at Cambridge. They met and married at Ballarat and for some time lived at Ballarat, leaving after the Eureka Stockade. Grandma’s two brothers took part in that fight, and after, left Victoria for California USA. 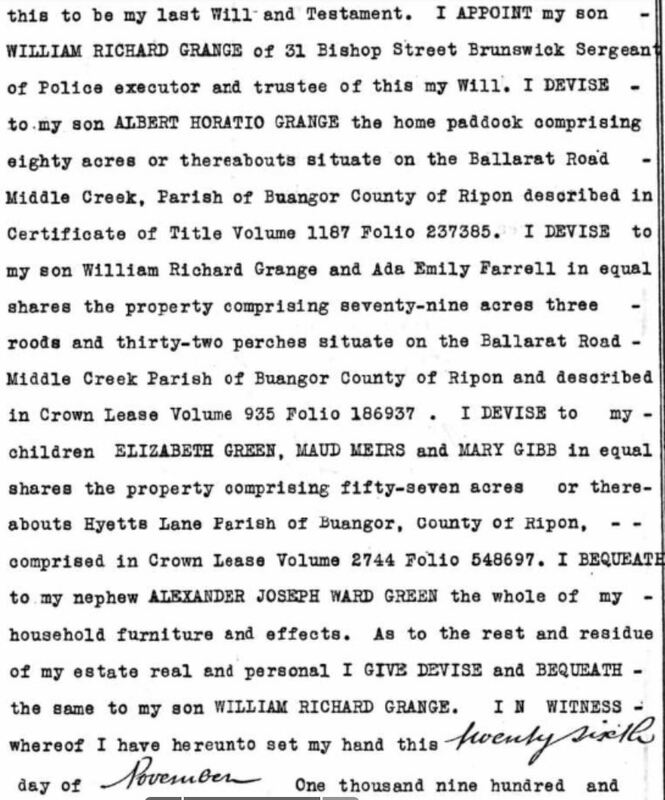 After leaving Ballarat, Grandfather Grange settled on some land at Middle Creek, raising a family of seven – 5 girls and 2 boys; girls – Sofia, Elizabeth, Maud, Mary and Ada; boys – Albert and William. Albert a blacksmith and later a wheat farmer in W.A. William a police inspector at Russell Street Melbourne. Sofia went to W.A. and married, making a fortune out of water, as it was the only well for miles in the desert. Elizabeth, Mary and Ada all married and lived in Melbourne. The following records are as per the International Genealogical Index (IGI) with some information from Ancestry.com. Richard Grange’s parents were William Grange (1783?-1853?) and Elizabeth Baker Firmin from Essex. William Grange was a miller., born born about 1783 at Marks Tey, Essex, a small village about five miles southwest of Colchester. According to the IGI a William Grange was christened at Marks Tey to Will and Ann Grange on 27 Sep 1783. A William Grange married Elizabeth Firmin 17 August 1829 at St Dunstan’s Stepney in the East end of London. I think it is possible that he married again to an Elizabeth Baker, but I suspect he married Elizabeth (nee Baker) who was first married to a Mr Firman. In 1841 the Grange family lived in Mill Lane, Bradwell-Near-Sea (also known as Bradwell-Juxta-Mare and Bradwell-On-Sea). By the 1851 census they had moved about ten miles south of Bradwell to 54 Mile Road, Burnham. He was listed as then being 65 years. At Bradwell according to the 1841 census two Essex born 17 year olds resided with the family – a female servant (Mary Judd) and a mill apprentice (John Hadgely). In 1851 at Burnham they also had a house servant (18 year old Emma Yardley). It may be that although doomed to lose most of their children the Granges lived in reasonable comfort. William Grange died aged 69 being buried on 22 December 1853 at St Mary The Virgin Church Burnham. His wife Elizabeth Grange was born at Borley, in northern Essex – just west of Sudbury – in about 1797. The IGI records the christening of an Elizabeth Baker at Borley on 29 March 1796. An Elizabeth Baker Grange died in the Maldon registry district in 1862. Hezekiah Grange Firman (1828-1838), born to Elizabeth Baker Firmin; christened 24 Aug 1828 at Bradwell-near-sea. Hezekiah Grange (Firman surname dropped) died aged 10 in 1938 with the service at St. Thomas church, Bradwell-On-Sea. Richard Grange (1833-1907), christened 9 Jun 1833. He was living with his parents at the 1841 and 1851 censuses. Julia Anne Grange (1835-1855), christened 8 Feb 1835. Also called Julia. She was living at home in Burnham at the 1851 census, but is not listed at the 1841 census. She died aged 19 with the service at St Mary The Virgin Church at Burnham. Horatio Grange (1836-1884), christened 4 Dec 1836. In 1858 he married Louisa Hollingsworth (born in nearby Danbury). At the 1861 census they were living in East Hanningfield, Essex, a small village about four miles south of Chelmsford and close to Bradwell, Burnham and Maldon. A 15 year old female general servant lived with them and his sister Sophia was visiting. The shop and house were in 1866 ‘on The Tye’ (high street). Louisa’s sister, Emily, a school governess, lived with them, aged 27, in 1871 as did a 13 year old servant, Clara Linnett. Children with approximate birth dates included: Harriet (1859), Elizabeth (1860), William (1862), Henry (1864), Maria (1865), Horace (1867), Herbert (1869), Ernest (1871). Horatio died aged 47 in 1884 and Louisa aged 51 in 1887. Both services were at St John the Baptist Church, Danbury. Sophia Amelia Grange (1840-1876), christened 22 Nov 1840. She was visiting brother Horatio at the 1861 census. She died in the Maldon district, aged 35 in 1876. My mother said that Richard always referred to Ellen as “the bond woman” – meaning that she was an indentured servant upon her arrival. Ellen was married according to the rites of the Church of England but she was a devout Roman Catholic. Richard insisted upon the children being brought up as protestant – but relented and let the last child be brought up catholic. I think Ellen must have had a very difficult life being married to a man who did not respect her, she had lost her family, her friends, her way of life, her culture and her country. I often think of her and how hard her life must have been and I always wondered when I heard Irish music why I cried – now I know why. Ellen is one of my very favourite ancestors. 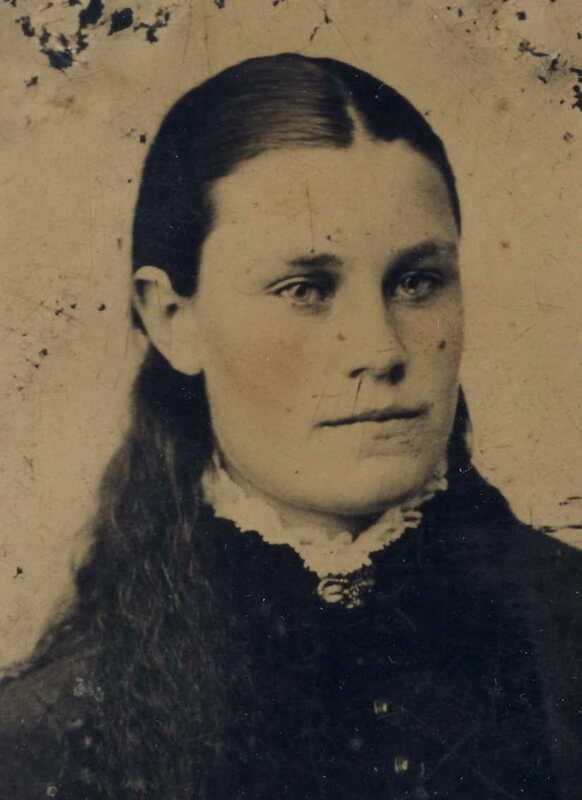 Her parents were Patrick Gilgan, or Gilgin, a farmer, and Bridget Carr. The name Gilgan was common only in the Leitrim/Sligo area to the west of Kingscourt, Cavan where Ellen was born. The Griffith’s Index of 1856 lists a John Carr as leasing a house and yard at 47 Market St Kingscourt – perhaps a relative. In the Dublin census of household heads from 1851 there are no Patrick Gilgans but 10 Patrick Gilligans (or similar spelling) and two Bridget Gilligans. A speculation is that Ellen was born in her mother’s family town of Kingscourt, but was brought up on a farm near Manonhamilton further west in Gilgan country and in her teens moved to Dublin, perhaps just briefly prior to embarking to Victoria. As opposed to the information above her grandson wrote in the 1970s the following which seems improbable “Grandma Grange’s name was O’Shea and came from County Clare, Ireland”. Ellen bore eight children. She died 10 April 1920 at 135 Napier Street, South Melbourne, aged 82 years and is buried in the Catholic section of Burwood cemetery. Home paddock of 80 acres at Ballarat Road, Middle Creek to son Albert Horatio Grange. Sold to John Hillman £641. 79 acres at the same address shared between William Richard Grange and Ada Emily Farrell. Sold to John Hillman £326 each. 57 acres near Hyett’s Lane, Buangor to Elizabeth Green, Maud Meirs (sic) and May Gibb. Sold to G.J.C. Green, £29 each. Household furniture and effects to nephew Alexander Joseph Ward Green. Two of her children were not included: Sophia Hallett and Eleanor Dean. Born at Middle Creek (9 November recorded) she married Alexander Joseph Green (1865-1920), born at Mount Cole near Ararat 15 March 1865, at South Melbourne in 1891. His parents were George Durston Green and Mary Ann Ward. In 1903 Alexander and Elizabeth lived at 215 Dorcas Street South Melbourne and by 1914 at 135 Napier Street, South Melbourne. He was a driver. Elizabeth died at Port Melbourne on 17 December 1934. 1.1 Ruth Ellen Green (Rowan)(1891-1976). Born at Natimuk, Ruth married Sydney Leonard Rowan (1886-1953) in Victoria in 1912. He was a boatman, sailor, mariner and later master mariner. In 1920 Sydney was chief officer of the dredge Henry Melkan in Port Phillip Bay. They lived at Yarraville and Spotswood before settling at 51 Evans Street Port Melbourne. 1.2 Elizabeth Mary Ann Green (1893-1894). Born in Footscray. 1.3 Alexander Joseph Ward Green (1897-1931). ‘Wardie’ Green enlisted aged 18 years and 2 months when he was still living at his parent’s Napier Street home in 1915. He embarked on the troopship Beltana on 11 Sep 1915. Wardie fought in the Middle East and France, where he was appointed as a driver. In 1920 he married Lillian Feodore Polkinghorne (1890-1983) and they had three children: Keith, Ron and Vernon (1928-1998). In 1924 they lived at 162 Coventry Street, South Melbourne. He died 28 August 1931 aged 34 when living at Shaftesbury Street Coburg. 1.4 Mary Veronica Green (Carlos/Ferrisey)(1901-1983). Known as Vera she married John Harold Carlos (1901 Bolton, England – 1928) in 1921. She had a daughter, Veronica Mavis Carlos who in 1923 died in infancy. In 1924 they lived at 410 Graham Street, Port Melbourne, he was a gramophone fitter and she a factory worker. Mary married again in 1929 to William Ferrisey (1900-1990) of 296 Ross Street Port Melbourne, a cook, later chef and shop keeper. They lived for about 40 years at 31 Wallingford Street, Cheltenham. He has born in Cardiff, Wales in 1900. In 1938 he was held up in his shop. Norine Elisabeth Ferrisey and Ruth Marie Ferrisey (Gell) were her children plus three daughters who married Macdonald, Barrett and Fairbairn. 2. Sophia Amelia Grange (Hallett)(1860-1939). Born in Ballarat, she married Henry R. Hallett (also known as Regia Henry Hallett)(1870-1925) at Broken Hill in 1892 NSW Reg 2763. According to a letter from Harry Meier “Sofia went to W.A. and married, making a fortune out of water, as it was the only well for miles in the desert”. By 1897 Henry Hallett had a bakery in Cue with a Mr Leyshon. In 1898 they had a bakery and dairy. Soon after Henry Hallett moved to the Geraldton area. 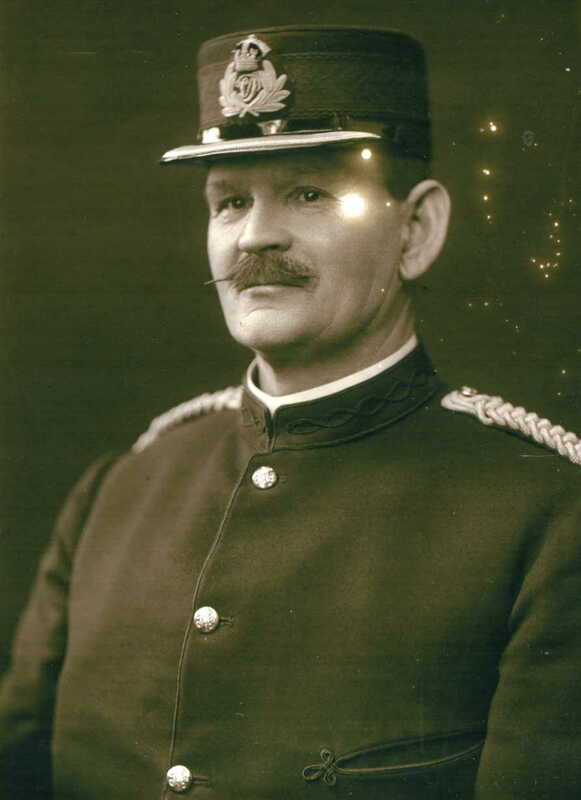 He was a dairy farmer of Chapman Road Geraldton and a director of the Victoria Co-op Flour Mill. He also had a wheat farm north of Geraldton at Oakabella “5 miles west of Isseka siding”. “was greeted with very great respect by a wide circle of friends, though it was not altogether unexpected, as it was known his health of late had occasioned great anxiety. Mr. Hallett, who was about 55 or 56 years of age, came to Western Australia from Broken Hill, and engaged in the dairying business at Cue. After a short while he removed to Geraldton. Here he conducted a dairying business for many years, subsequently disposing of it to Messrs. Dunn Brothers. Mr. Hallett also successfully carried on farming at Oakabella for about 20 years, and was also interested in other activities, being for several years chairman of directors of the Victoria District Flour Mill. A shrewd, genial man, he was held in the highest esteem. A few years ago he removed to Perth, and of late his health had gradually failed”. Note that Henry R. Hallett’s grandfather was John Hallett who arrived in South Australia on the L’Africaine in 1836 was one of that state’s earliest pioneers. It was claimed that his was the second white child born in the State. It is also said that the first stone house built in South Australia was erected by this John Hallett. He owned stations, Wandillah and Wininninie, the latter where Henry R. Hallett was born. An obituary. Sophia Amelia later moved to Sydney with her daughter Maud but died on January 25 1939 in Perth aged 81 years, when she was living at the Melbourne Hotel. 2.1 Victoria Maud Hallett (1893-1894). Born at Broken Hill, she died in infancy at Norwood, Adelaide in 1894. 2.2 Twin John ‘Jack’ Hallett (1893-1915). Registered at birth as Regia Henry or Henry Regia Hallett, Jack was a stockman when he enlisted in the 10th Lighthorse in November 1914, to be killed at Gallipoli. 2.3 Selby Grange Hallett (1895-1925). Nicknamed ‘Dood’ he was born in the West Australian mining settlement of Day Dawn. He enlisted in January 1916 following his brother Jack’s death. Selby fought in France and suffered from the trauma then called ‘shell-shock’. He attempted to commit suicide on the troopship home and succeeded ‘gaining release from his pain’ when his body was found in the Swan River at Crawley on 11 June 1925. He was aged 30. His father died six days later. Selby Hallett’s funeral notice. 2.4 Maud Amelia Hallett (1897-1940). Born in Geraldton. A newspaper article of 9 August 1925 (just after the death of her brother Selby) reports on a party to farewell Maud Hallett on a trip to Singapore and the Malay states. She had moved to Sydney by 1930, living at “The Albany” 201 Macquarie Street and later at 1 Elizabeth Bay Road. She died a spinster in 17 October 1940 when living at ‘Marlborough Hall’, Roslyn Avenue, Elizabeth Bay. She and owned a number of properties in Perth whuch were auctioned off in 1944. 3.1 Alice Maud Dean (1887-1976). She was born at Ballarat East. In 1919 she was lived at ‘Yalca’, The Esplanade, St Kilda where she was probably a domestic servant. In 1924 she was a waitress living with mother and siblings at 56 Mayston St Auburn, in 1931 a counterhand living with her mother at Springfield Road. She was a spinster in 1946 and executor of her mother’s will. Alice died at Murchison in 1976. 3.2 Nellie Grange Dean (Hawes)(1888-1980). Born at Creswick. In 1914 she lived at Eilyer Homestead, Woorndoo. She is also listed at the mansion of A. Rutter Clarke in Orrong Road Toorak. In 1919 she is listed at another mansion, Linden in Acland Street, St. Kilda. In 1924 she was a manageress living with her mother and siblings at 56 Mayston St Auburn. That year married Basil Adrian Hawes (1881-1968), a commission agent. They lived at ‘The Grange’ with Nellie’s mother. In the mid 1950s they moved to Sydney, living at 97 Wyndora Avenue, Harbord and later at Carlton Street, Manly. She had a daughter, Eleanor, who died before 1968, and a son William (1919-2008), who’s wife was Barbara. Basil died 29 Oct 1968, aged 87 at Manly. Nellie died 20 June 1980 at Manly. 3.3 William (Will) Frederick Dean (1890-1983). Born at Clunes, he seemed to have been married to Leila Alice Lyster from 1911 to 1922 when she died. In 1924 he was a railway employee living with mother and siblings at 56 Mayston St Auburn. In 1926 he remarried to Sarah Jackson and they lived the rest of their lives at 67 Doncaster Street Ascot Vale. I think Sarah died in the mid 1960s. William had a son Frederick George Dean (1914-1975). Will died in 1983 at Newport. 3.4 Hannah Mary Dean (Grice)(1892-1979). Born at Clunes, in 1919 she was a dressmaker living with sister and mother at 20 Oberon Street, Auburn. She married a Mr Grice. In 1972 she lived at Sandringham and died aged 86 at Cheltenham in 1979. 3.5 Isabella Acroyd Dean (1895-1902). Born at Clunes, she died aged 7. She is buried at Box Hill. 3.6 Henrietta (Hetta) Harriet Dean (Barry) (1896-?). Born at Frankston. In 1919 she was a dressmaker living with her sister and mother at 20 Oberon Street, Auburn. She married Albert (Bert) Barry (1891-1948) in 1924 and they lived at Gezireh Street, Pascoe Vale. Albert who fought on the Western Front died at Heidelberg Military Hospital. 4.1 Richard Gordon Grange (1892-1982). Born at Brunswick on Christmas Eve 1892, Richard Gordon Grange was a motor mechanic. He enlisted in the 7th Battalion in 1914 and was wounded at Gallipoli. Discharged with a bad shoulder injury he re-enlisted in 1917, this time in the flying corp where he worked on planes at Laverton. His service record is extensive. He married Lilian McGuiness in 1925 [Vic reg 104] and lived at Diggers Road Werribee. He was in the RAAF in WW2. In 1967 he was living at 181 Cashmere Street, Ascot Vale. He died in 1982. I have copies of some letters he wrote to his cousin Maude McPherson (nee Meier) during the war. 4.3 Harold William Grange (1896-1986). Born at Carlton, Harold was a motor body builder for Tarrant Motors when in 1915 he enlisted and fought with the 7th Battalion. He married Grace Elizabeth Mays Bond (1900-1982) in 1941. They were farmers at Lake Bolac. He died aged 90. 4.4 Olive Grange (Mehegan) (1898-1994). Born at Brunswick, Olive married Dan Mehegan (1898-1963) and lived at 9 Athestone Street, Coburg. 4.5 Albert Edgar Grange (1900-1989). Born at Brunswick, he enlisted when 18 and was in the RAN during WW2. He married Ada (Nellie) May Parker (1888–1960). In 1970 he married widow Ella Ruby Hennig at Murray Bridge. They were both members of the Seventh-Day Adventist church. He died at Murray Bridge. 4.6 William Garnet Grange (1902-1927). Born and died at Brunswick aged 24 at his parent’s house, after ‘patient suffering’. 4.7 Ethel Mary Grange (Webb) (1904-2000). Born at Brunswick, she married Roy Hallett Webb (1901-1994), a railway employee in 1925. They lived at Rose St, West Brunswick for more than 50 years. 4.8 James Edward Grange (1906-1963). In 1923 he accidently shot his friend Charles Mehegan. He enlisted in WW2 and in 1944 was living at 31 Bishop Street Brunswick with his mother. 4.9 Leslie Robert Grange (1909-1980). Born at Brunswick he farmed at Lake Bolac for many years before returning to Melbourne where he was a driver. He died in 1980 at Balaclava. 4.10 Isobel Muriel Grange (Jones) (1914-1961). Lived at Brunswick and was a machinist. She had a son James William Jones in 1939. 4.11 Dulce Adams Grange (Cook) (1914-1943). Twin of Isobel. She married Raymond Cook she died in 1943 while he was in the AIF. 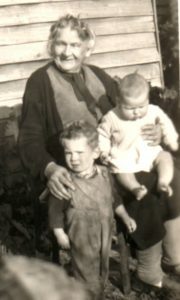 Alice Maud Grange (Grandma Meier) with two great grandchildren. 5. Alice Maud Mary Grange (Meier) (1866-1954). Born 1866 in Ballarat, she married Lou Meier at Ararat on 21 January 1890. She was known as Maud. See the Meier file for more information and a full list of her children. Maud died 29 September 1954 aged 88. 6. Albert Horatio Alfred Grange (1868-1961). Born at Ararat, he went west and died in Perth, aged 93. He seems to have gone by the name of Alfred. He ‘did well’, did not marry, and gifted a farm at Pakenham to his nephew Roy Meier. It is thought he moved to W.A. in the 1890s. There was an A. Grange on a ship from Melbourne to Albany and then Albany to Fremantle in 1891. An A. Grange arrived at Fremantle on SS Gabo on 18 February 1896. An article in the Perth Daily News of 18 April 1898 reports of a Mr Grange, prospector, “taking up a protection area near the west line of the boundary of the Gabanintha line at the Star of the East. Gabanintha and Star of the East became small goldming goldmine settlements in the Peak Hill district of outback W.A. near Nannine. ‘About one mile and a half north of the Lauriston [mine], is the Wallaroo G.M., on which a vertical shaft has been put down to 65ft. A crushing put through yielded 5 oz.- 12 dwt. per ton over the plates , and the tailings assayed 28 dwt. per ton. The progress made in developing this show is very slow, owing to the great inflow of water. The owners have a vertical boiler and pump on the mine, but require a plant of much greater capacity. A bit of capital is also wanted to open the mine up, for there is little doubt that it would turn out well. At present the prospectors are put to the expense of working the boiler and pump three shifts for the work of one shift, which, taking the expense of fuel, etc. into consideration, places them at a great disadvantage. Messrs. Grainge and Mapp are the prospectors. Charles Mapp came from Wallaroo South Australia, hence the name of the mine. From the geological survey it looks as though after 393 ounces of gold within two years further mining became uneconomical. In the 1903 and 1906 electoral rolls Alfred Grange is listed as an engine driver at the Golden Spinifex gold mine at Duketon in the Erlistoun field. This was more than 80 miles NE of Laverton in the desert. In 1910 he was located at the Waverley mine at Siberia, west of the town of Menzies. He did not own that mine, which was quite a large successful enterprise. In 1911 an Alfred Grange and a H. Davies were granted nearly 2000 acres of wheat land near Lake Jilakin in WA. The partnership was formally disolved in 1917. In the Post Office directories he is listed as a contractor at Dumbleyung between 1912 and 1915. In the 1916 electoral roll he is listed as a prospector at Dumbleyung, which is about 100 miles SW of Lake Jilakin. Dumbleyung was also a wheat town, but without a history of mining. In the PO directories he is listed as a farmer of Kulin between 1921 and 1925. Note that Kulin was called Jilakin until 1913. In the 1925 electoral roll Alfred has retired and was living in central Perth at 9 Pier Street. At the elections from 1931 to 1949 he resided at Creery Road Mandurah and in 1954 at Forrest House Bunbury. By 1958 he returned to reside in Perth at 2 St Georges Terrace, which looks as though it is also named Forrest House – probably a retirement residence or hospital. His probate notice in 1961 recorded his address as 1 Rokeby Road, Subiaco. Born at Flemington. Also known as May she was a typiste/clerk. In 1931 she is listed at ‘Buangor’ Surrey Rd Blackburn with her mother. Later she lived at 4/51 McCulloch St, Nunawading. She died at Donvale. 8.1 Albert Matthew Grange Farrell (1909-1931). He was charged with housebreaking aged 19. 8.2 Walter William Farrell (1912-1914).